What Kind of Fabric to Use for a Canopy? Whether you are setting up a covered area outdoors for a function, such as a wedding or birthday party, or camping in the wild, it is important you choose the right canopy fabric. Over the centuries many materials have been used to make tents, lots of which are no longer used for various reasons. Today man-made fibers are the norm for any kind of outdoor structure. 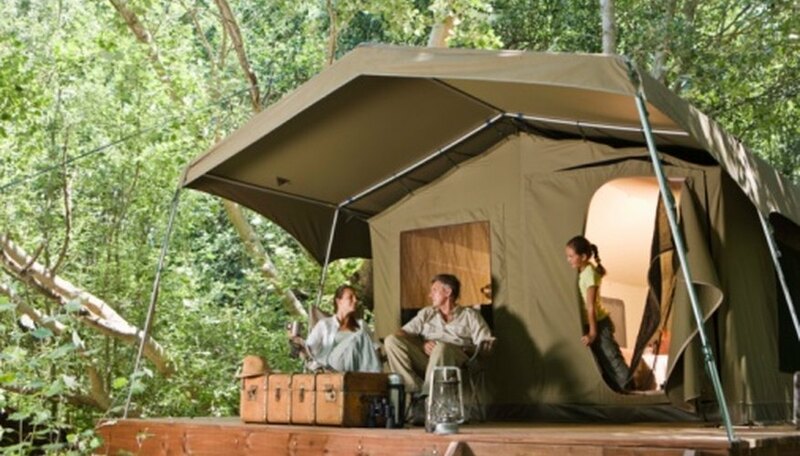 Until man-made fibers became economical, canvas was the main material used for canopies for both outdoor structures and tents. It is a woven cotton fabric and is often treated with products such as paraffin to make it waterproof. It can also be easily dyed different colors which is a major advantage. The main problem with canvas is that it can become waterlogged which makes it very heavy. Nylon was one of the first man-made fibers, first developed during the 1930s by American chemical company DuPont. It is very strong, waterproof and lightweight, making it ideal for all kinds of canopies. Its main advantage over canvas is that the weight does not increase when it is wet. Another man-made fiber used for canopies is polyester, or polyethylene terephthalate. It is a plastic polymer which is woven into standard fabric to make it stronger, including canvas. The addition of polyester improves the waterproofing and stops the material gaining weight during rainfall. Polyester can also be mixed with nylon. Any material which is woven with polyester is instantly made a lot stronger. One of the original canopy materials was felt. It is produced by matting woolen fibers which condenses the fibers of the fabric. It can be treated with substances to make it waterproof as well and can be easily dyed. As a canopy material it is not used much anymore apart from by central Asian nomads. Animal hides were the tent-making material of choice for the Native Americans. The skins required little treating as they were already waterproof and windproof. Although still used by some Native American tribes, this material is difficult to get ahold of and a lot more expensive than the man-made alternatives. What Types of Paint Can Be Used on Canvas?